I’ve been finding myself in the kitchen a lot recently. I’ve also grown the need to document every meal I cook, and every bite I take. It’s not an obsession…at least not yet. Today I decided to explore the classic pairing of apple and pork. 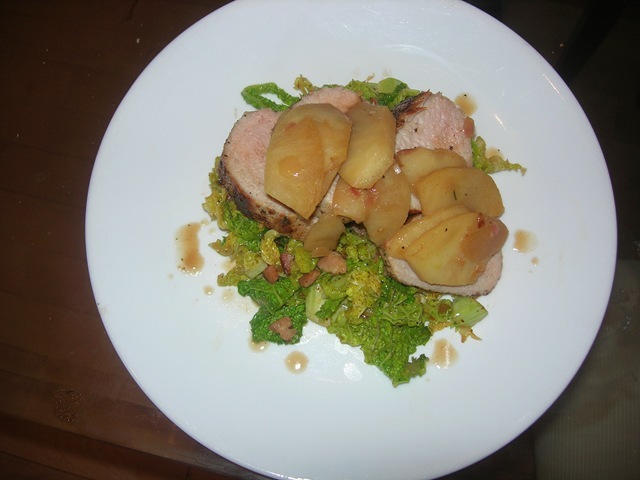 I call this dish “Roast Loin of Pork with Bacon Sauteed Savoy and Apple Cognac Compote”. 1. 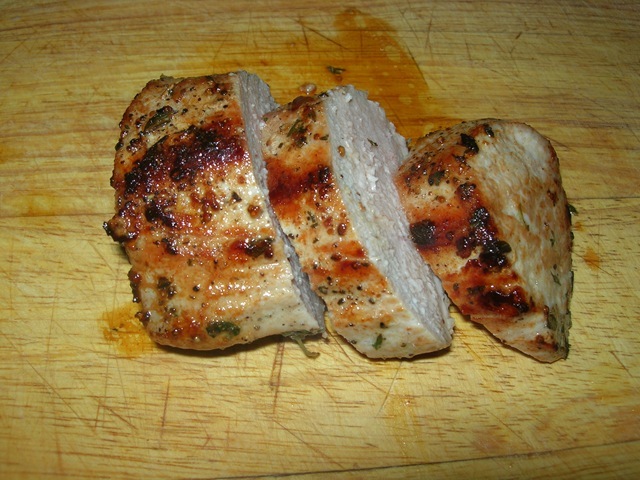 Liberally season loin of pork with salt, pepper, and fresh thyme. 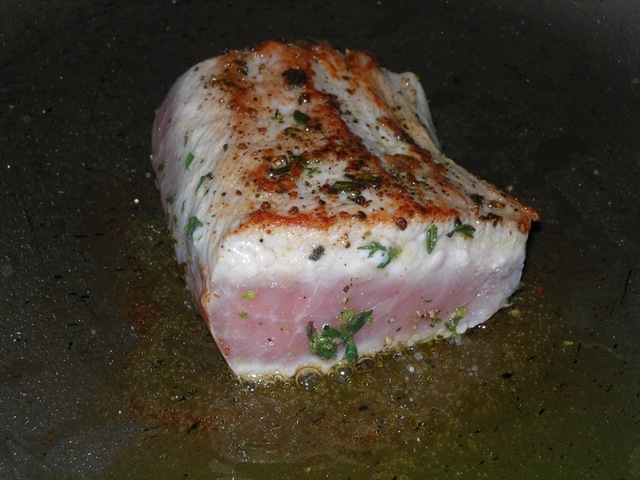 Pan sear until medium-well (or sear, and bake in oven at 375 degrees Celsius for 10 minutes). Allow meat to rest for 5 minutes. 2. Dice and sautee two strips of smoked bacon until crispy. Add 1/4 cup of onions and cook until caramelized. 3. Add I cup of julienned Savoy cabbage. 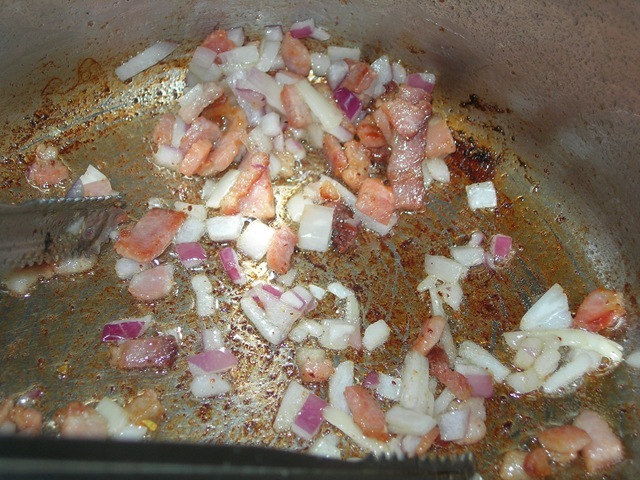 Deglaze pan with 1/4 cup of chicken stock being sure to scrape bacon juices from bottom of pan. Cook for 3 minutes, or until cabbage is slightly tender. 4. Next, in same pan pork loin was prepared, add 1/4 cup of onions and cook until caramelized. Peel, seed, and slice one granny smith apple and add to pan. Add a couple of knobs of butter, and allow apples to soften. Deglaze pan with 1/8 cup of cognac (or calvados). Add 3/4 cup of chicken stock, and 1 tablespoon of dijon mustard. 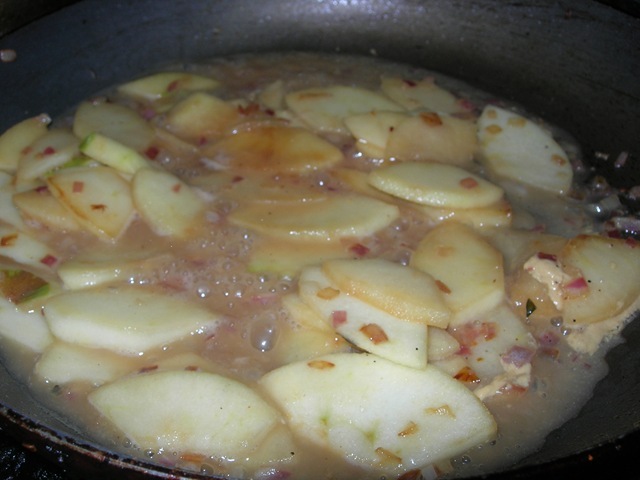 Allow to reduce until apples are tender and liquid had thickened. 5. Slice rested loin on the bias. Ooo looks delish! The pan you’re using looks huge, almost like a wok or something. I don’t normally like pork, but that looks amazing! Cheryl: The pork and compote were done in a sautee pan. 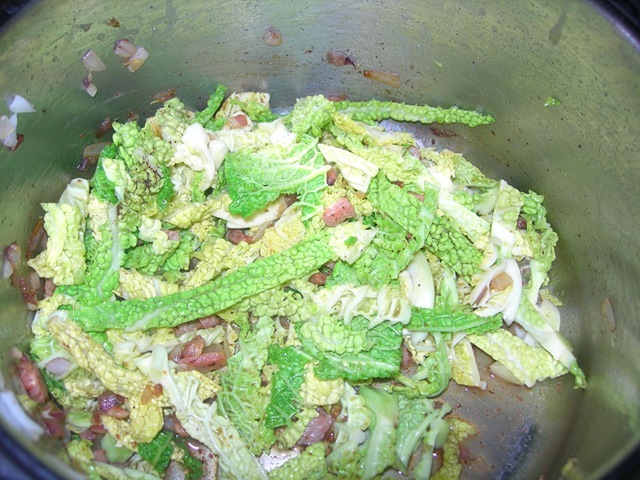 The cabbage however was done in a small stock pot. I haven’t gone asian on you yet…just wait for it! Pauline: Glad I could bring you back on the pork band-wagon. The world is a better place with bacon in it. Lunch any day!